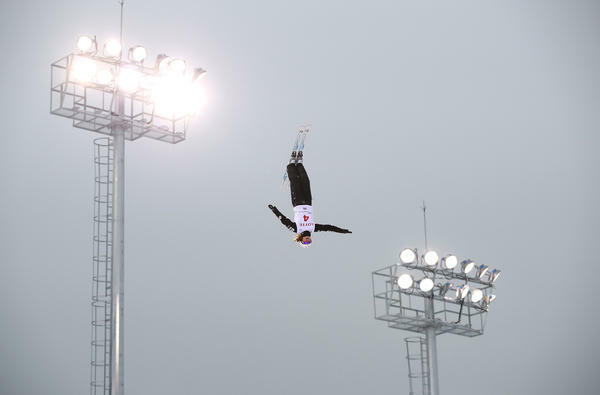 Ashley Caldwell performs an aerial before the World Cup last February. When she watched aerials for the first time at age 12, she remembers thinking: "Why are these people so crazy?" 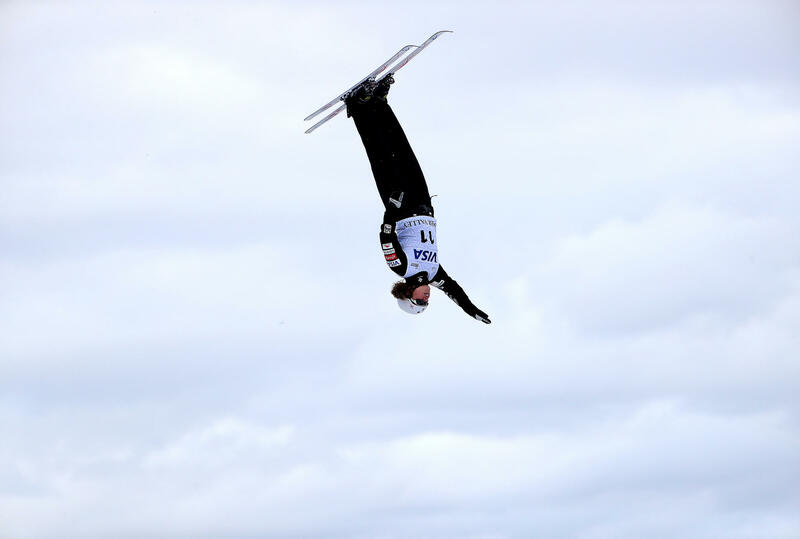 Freestyle skier Ashley Caldwell, shown here in September, began training full-time at age 14. Ashley Caldwell celebrates after winning the gold medal in the Women's Aerials Final at last year's World Championships in Sierra Nevada, Spain. 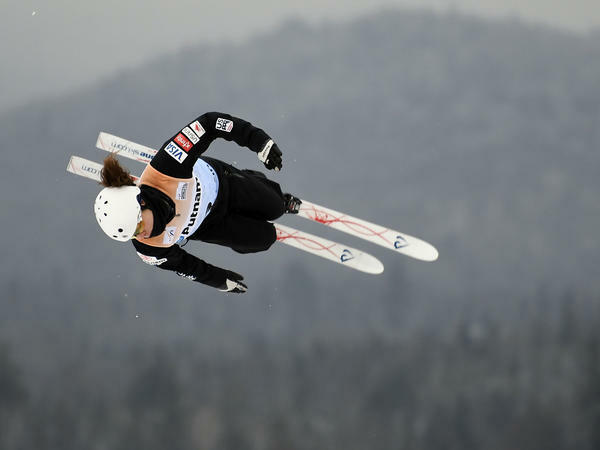 Ashley Caldwell competes in the Ladies' Aerials qualifying during the 2018 FIS Freestyle Ski World Cup on Jan. 12 in Park City, Utah. From the time she started competing, "I wanted to be jumping, doing as big tricks as the boys were," she says. Caldwell competes in the women's World Cup freestyle skiing aerials in Lake Placid, N.Y., on Jan. 19. "I always wanted to be like the boys for a long time," she says, "and now I like it when my coaches treat me like me." Since she was a little girl, Ashley Caldwell has been in constant motion: jumping out of her crib, tumbling off the couch, leaping down stairs, flipping on a trampoline. 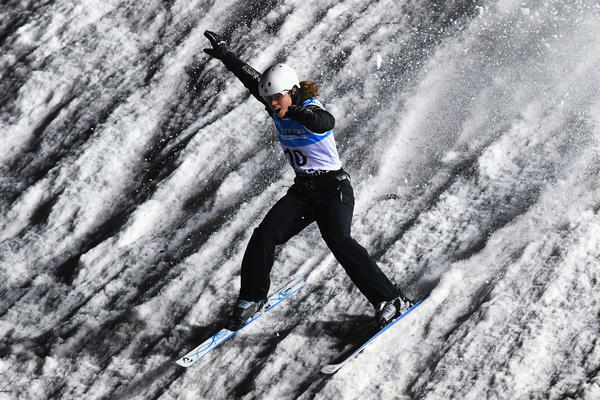 So it seems fitting that now, at 24, Caldwell is the reigning women's world champion in aerials skiing — a sport in which she somersaults and spins through the air, some 60 feet off the ground. Caldwell is about to compete in her third Olympic Games. Along the way, she's pushed the boundaries for women in her sport. She won gold at last year's World Championships by doing something no woman had ever accomplished. She made a successful, clean landing in a quadruple-twisting triple flip: a full, double full, full. "They call it the 'Daddy' of all tricks," Caldwell says. "It is a really big trick. Only two girls have ever done it, and I'm the only one who's ever landed it, so it's a bold move." In fact, just a handful of women aerial skiers around the world attempt triple jumps, even those with a much lower degree of difficulty than the Daddy. First, she launches off a 14-foot jump, arms raised, at speeds approaching 45 miles per hour. She does her first backflip, combined with a 360-degree rotation, or twist. She brings her arms in tight, mummy-style, and does her second backflip — this time with two 360-degree spins. She does her third and final backflip, with another 360-degree spin. She looks at the slope below and preps for landing. If all goes well, she lands clean, hands up. And all of this happens in about three seconds. Triples are much more dangerous than doubles; the risk of injury much greater. "It's so much faster," Caldwell says, "and the hits are so much harder." But soon after she started competing as a young teenager, Caldwell set her sights high. "I wanted to be jumping, doing as big tricks as the boys were," she says. Caldwell first saw aerials as a 12-year-old in Virginia, watching the 2006 Turin Olympics on TV. "Why are these people so crazy?" she remembers thinking. Her mother Leslie had a different thought. "'You'd be good at that,'" Caldwell recalls her mother telling her. "And I looked at her and went, 'You're crazy.' Who tells their 12-year-old daughter they'd be good at doing triple back-flips 60 feet in the air?" Mom does, and mom was right. Caldwell was already a strong gymnast, and a skier. At 13, she headed up to New Hampshire to spend the summer at a ski academy, found she loved aerials and excelled at it. Straight away, she was recruited to join the Elite Aerial Development Program in Lake Placid, N.Y., and at age 14, she moved from her home in Virginia to train full-time at the Olympic Training Center there. By 2010, just four years after seeing aerials for the first time, Caldwell was walking into opening ceremonies at the Vancouver Olympics — at 16, the youngest member of Team USA. But even as she rose through the sport, Caldwell found her coaches were skittish about letting her try triple jumps. They felt it was too risky. "I've definitely gotten pretty upset with my coaches," she says. "But I had to. I had to push 10 times as hard [as the guys] in order to do triples ... I got up on the hill every day and had to beg for it. I don't have to beg anymore, because I've proved myself. But it took a long time." Caldwell's teammate, Mac Bohonnon, says the scoring scale is one factor dissuading women from doing triples. At the elite level, men have to do triples to be competitive. But, Bohonnon says, triples aren't scored with a high enough degree of difficulty to make them worth the risk for women. "It's a more dangerous jump, it's a more challenging jump, it's a scarier jump," he says, "and I think there's no reward for women doing triples. In my eyes, they're almost punished. They're getting beat by easy doubles." The logic goes, if you can reach the podium more securely with a less challenging jump, why not just stick to a double? For Caldwell, that's not the point. "I decided I would forgo some of those podiums in exchange for doing my best tricks, and trying to see how good I could be," she says. And who knows what tricks might still be to come? "Ashley's really still at the beginning or middle of her career," says U.S. head coach Todd Ossian. "She's got a lot of jumping left in her. She's certainly taken this sport to another level." Caldwell's success in those big, quadruple-twisting triple jumps has also led to some good-natured ego tweaking among her male teammates. "Ashley was doing the same tricks as our entire men's team," Ossian says. "She really pushed the rest of our guys to start doing five twists in the triples. So they say, 'Hey, if Ashley's doing four twists, I better add one so she doesn't catch up!'" Caldwell's approach to gender and sport has shifted over time. As she recently tweeted, "I think every time I said that I wanted to 'jump like the boys' I was reaffirming that boys are the standard. I don't think that helps gender equality." So if she has a message to send, Caldwell says, it's not just aimed at girls. "I want it to be to boys and girls, men and women everywhere. Quit talking about gender. Be your best. It doesn't matter what's between your legs. Go out there and be your best," she says. "I always wanted to be like the boys for a long time, and now I like it when my coaches treat me like me." As for that quadruple-twisting triple flip she landed to win Worlds — the jump known as the Daddy — Ashley Caldwell has a suggestion: Maybe it's time, she says, to call it the Mama. To South Korea now where this week at the Olympics, aerial skiers will launch themselves skyward off nearly vertical jumps. They're going to soar some 60 feet up in the air, flipping and twisting their way back to Earth. UNIDENTIFIED MAN #1: Look down the hill. We're good. Reach. 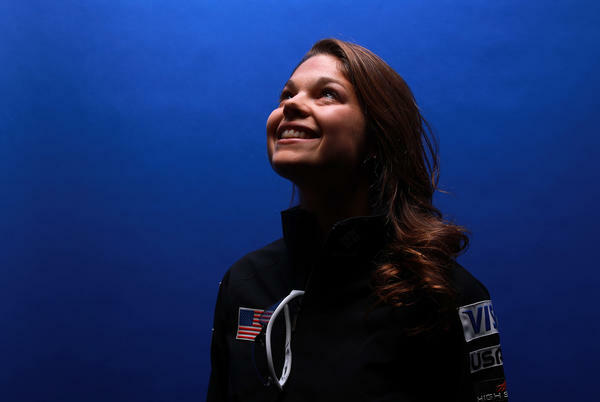 KELLY: NPR's Melissa Block introduces us to a U.S. aerialist who is pushing the boundaries of the sport for women. ASHLEY CALDWELL: Why are these people so crazy? BLOCK: Her mother was watching with her and had a different thought. CALDWELL: My mom looked at me and said, you'd be good at that. And I looked at her and went, you're crazy (laughter). Who tells her 12-year-old daughter that they'd be good at doing triple backflips, you know, 60 feet in the air? UNIDENTIFIED MAN #2: You're good. You're good. BLOCK: Caldwell was already a strong gymnast and a skier. So zip ahead four years, and there she is, walking into opening ceremonies in Vancouver an Olympic aerialist. At 16, she was the youngest member of Team USA. And it didn't take long for Caldwell to set her sights even higher. CALDWELL: I wanted to be jumping, doing as big a tricks as the boys were. CALDWELL: A lot harder. It's so much faster. And the hits are so much harder. BLOCK: And now the 24-year-old Caldwell is pushing the boundaries still further. At last year's world championships, she did something no woman had ever done. She launched into a quadruple twisting triple flip - a full, double full, full. CALDWELL: They call it the daddy of all tricks. BLOCK: And she landed it, making her world champion. CALDWELL: It's a really big trick. You know, only two girls have ever done it, and I'm the only one's ever landed it. So it's a bold move. BLOCK: Let's break that trick down because it happens so fast it's a blur. Caldwell will launch off the jump and do her first backflip combined with a 360-degree rotation. So she's flipping and twisting through the air at the same time. BLOCK: Then she does another backflip, this time with two 360s. BLOCK: But wait. There's more. CALDWELL: ...So that I can do a single twist on the last flip. BLOCK: That's the third somersault with another 360. CALDWELL: And then I'll prep for landing after that. BLOCK: And all of that happens in how many seconds? CALDWELL: About three seconds kind of depending on how big you go. CALDWELL: That is pretty wild. BLOCK: Triple jumps are a lot more dangerous than doubles, the risk of injury much higher. And Caldwell found as she came up through the sport her coaches were skittish about letting her try them. CALDWELL: I've definitely gotten pretty upset with my coaches, but I had to. And that's another frustrating element of being a girl doing triples - is that I had to push ten times as hard in order to do triples, whereas the guys just had to. There was no question about it, whereas I got up on the hill every day and had to beg for it. I don't have to beg anymore because I've proved myself, but it took a long time. BLOCK: So why don't more women aerial skiers do triple jumps? Caldwell's teammate Mac Bohonnon points to the scoring scale. He says triples aren't scored with a high enough degree of difficulty to make them worth the risk for women. MAC BOHONNON: It's a more dangerous jump. It's a more challenging jump. It's a scarier jump. And, you know, I think it's - there's no reward for women doing triples. In my eyes, they're almost punished. They're getting beat by easy doubles. BLOCK: So the logic goes, if you can reach the podium more securely with a less challenging jump, why not just stick to a double? For Caldwell, that's not the point. CALDWELL: I decided that I would forego some of those podiums in exchange for doing my best tricks and trying to see how good I could be. BLOCK: And U.S. head coach Todd Ossian says Caldwell's success has led to some good-natured ego tweaking among her male teammates. TODD OSSIAN: She really pushed the rest of our guys to start doing five twists in the triples. So they say, hey, if Ashley's doing four twists, I better add one. BLOCK: As for that quadruple-twisting triple jump she landed known as the daddy, Ashley Caldwell has a suggestion. Maybe it's time, she says, to call it the mama. Melissa Block, NPR News. Transcript provided by NPR, Copyright NPR.